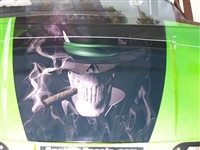 This Decal will replace your Factory CLUB CAR Logo in the front of your cart. This Decal will replace your Factory EZGO Logo in the front of your cart. Golf Kart (Cart) Plain 6" Stripe Graphic Decal Set! than enough to do the front and rear of any Make or Model Golf cart! Please pick your color from the drop down Menu Golf Kart (Cart) OUTLINED 6" Stripe Graphic Decal Set! than enough to do the front HOOD of any Make or Model Golf cart! Please pick your color from the drop down Menu Golf Kart (Cart) OUTLINED 7" Stripe Graphic Decal Set! than enough to do the front on any Make or Model Golf cart! real Tree Golf Kart (Cart) OUTLINED 7" Stripe Graphic Decal Set! Please pick your color from the drop down Menu Golf Kart (Cart) Plain 11" Stripe Graphic Decal Set! Please pick your color from the drop down Menu Golf Kart (Cart) OUTLINED 8" Stripe Graphic Decal Set! kart, snowmobile, fun kart, mother in laws Lincoln, whatever. make your cart standout from all the others! your Golf kart, snowmobile, fun kart, mother in laws Lincoln, whatever. Please pick your color from the drop down Menu Golf Kart (Cart) Plain 5" Plain Stripe Graphic Decal Set! Golf kart, snowmobile, fun kart, mother in laws Lincoln, whatever. steering fairing, helmet, top of side panels - where ever. Please pick your color from the drop down Menu Golf Kart (Cart) Plain 15" hood Stripe and 9" Side stripe Graphic Decal Set! Two large Stripes - 15" Wide x 24" long hood stripe and 2 9" wide X 39" long Stripes for each side. Golf Kart (Cart) With Flames 15" hood Stripe and 9" Side stripe Graphic Decal Set! Decals are Made of High Quality 3M Graphic Vinyl Film. 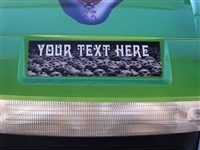 Auction is for 1 Decal as Pictured . These are a super easy way to make your Golf Cart, Car, truck, Boat or Trailer standout from the rest!! 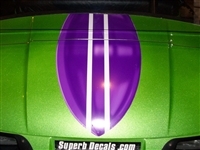 Golf Cart Surfboard Hood and Side FULL COLOR Graphics Set ! 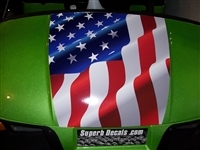 These are a super easy way to make your Golf cart standout from the rest!! The latest state of the art Eco solvent printer is used in the printing process for this Vinyl Wrap. The material, made from air-release liner inkjet vinyl's, allows for easy removal of trapped air bubbles.